The chefs at Julia's prepare all of our menu selections from scratch, with the goal of creating a unique dining experience for breakfast, lunch and dinner. 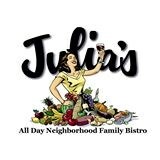 Julia’s has long ranked among Seattle’s favorite and award-winning restaurants. The homey eatery, with its wood tables, warm decor and bustling atmosphere attracts customers with wide taste buds and dietary needs. We serve many meat, poultry, seafood and vegetarian options from a mostly American menu with some international influences. It’s a great place for vegetarians to bring their carnivorous friends (and vice versa). Patio dining, in-house bakery, full bar and live entertainment are available at our Broadway location.